Make Christmas morning easy with this make ahead breakfast. This Monte Cristo Casserole Recipe can be assembled the night before, covered tightly and kept in the refrigerator until about an hour before you are ready to serve it. You don’t need much else to go with it — maybe some orange or grapefruit slices to brighten up the plate. For this recipe you will need the following supplies: sandwich bread, peach butter, pecans, Swiss cheese, deli smoked turkey, deli black forest ham, eggs, milk, half and half, salt, Panko bread crumbs, cinnamon, sugar, powdered sugar, raspberry preserves, chipotle powder. You will also need a 9×9 pan (I use glass). It would be great if the whole family gathered around the table on Christmas morning, nibbling on sweet rolls before heading to the parlor to carefully unwrap the gifts that Santa brought. It would be a dream come true if Christmas morning played out like a Norman Rockwell painting but around here it’s more like a super-chaotic flurry of flying gift wrap and ribbon. I literally used to give my kids boxes of cereal wrapped in Christmas paper and put muffins in their stockings so that I knew they weren’t eating pecan fudge for breakfast. Not that there is anything wrong with pecan fudge for breakfast, or lunch, or dinner for that matter. This year all of my kids will be home for the first time in ten years. I know I’ve said it before but I have to keep reminding myself that it’s really happening! Kids, spouses, and grandkids will fill my house for a Christmas I will remember for the rest of my life. Sometimes I make cinnamon rolls, and I may yet decide to add them to the menu but I’ve decided my main breakfast/brunch dish is going to be my favorite Monte Cristo Casserole. I make Monte Cristos a little differently than most and they are amazing. I wanted to translate that amazingness (totally a word) to a casserole and I was so happy when it worked. It worked well. Really, really well. I use peach butter and pecans to add a little more flavor to the casserole and it goes well with the raspberry chipotle drizzle that tops the finished brunch casserole. The casserole itself is made up of layers of bread, turkey, ham, and Swiss cheese. The crumbs on the top add a crispy crunch so that you have creamy, smoky, sweet, gooey, crispy goodness in every single bite. Best of all this easy brunch casserole can be assembled the night before (just leave the crumbs off until just before baking) and it feeds a crowd. Just think, maybe this Monte Cristo Casserole will be the thing that turns your chaotic holiday into a scene from a Norman Rockwell painting. Even if it doesn’t it’s still dang awfully good. Don’t save this just for holidays. It is a fabulous brunch or light dinner anytime! 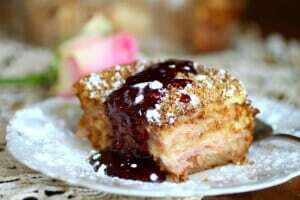 Here’s the Monte Cristo Casserole recipe. I hope you like it as much as we do. This easy casserole tastes just like the best Monte Cristo you ever had but it’s quick and easy to put together. You can even assemble it the night before – just leave the crumbs off, cover tightly and refrigerate. About an hour before serving remove the cover, sprinkle with the crumbs, and bake as directed. It's perfect for any holiday brunch or a light supper. Prepare a 9-inch square baking dish by spraying it with cooking spray. Toast the bread and spread each slice with the peach butter. Lay 4 slices of the toast with peach butter side up in the baking dish. Sprinkle with 1/2 the pecans. Cover with 1/2 of the cheese. Cover the cheese with 1/2 the turkey and then cover that with 1/2 of the ham. Repeat layers, ending with the last four pieces of toast – add them peach butter side down. Whisk the eggs, milk, cream, and salt together until well blended. Mix the breadcrumbs, cinnamon, and sugar and sprinkle over the top of the casserole. Gently but firmly press the top down. Bake at 375F for 50 minutes. Cut into squares, dust tops with powdered sugar, and drizzle with the raspberry chipotle sauce. Mix the chipotle powder into the raspberry preserves. Microwave on high for 1 minute, or until preserves are syrupy. How many eggs would you use for a 9×13 pan? You’ll need to add half again as much… so 6 eggs, 18 slices of bread, 3/4 cup of half and half, etc. Wow, cool tips, this recipe looks amazing, it must be very delicious!!! Wow! Love Monte Cristos and you just took it to a whole new level. What a creative dish! Thank you. I just love it. Nothing beats a great casserole and this one knocked my socks off. My son just flew home for the holidays tonight. I was so happy to see him. 2 weeks with my whole family, I’m a happy mama bear. It’s always so exciting! I have another one coming in tonight! 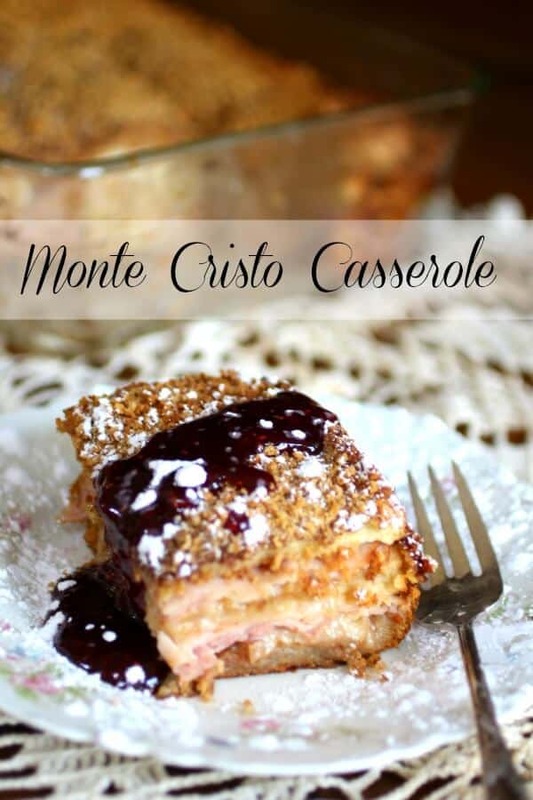 I LOVE monte cristos but I might love it even more in casserole form…yum! How awesome that all your kids will be with you this Christmas!! I know you’ll cherish that! This casserole looks so perfect. I adore Monte Cristo sandwiches (a little too much!) but I love the idea of making them into a little less work. A LOT less work! 🙂 Thanks Julie! Yes, yes, YES! This is absolutely brilliant! I had to stop in when I saw the name of your recipe and I am so excited now to try it! I love Monte Cristos…yum! Wow. This sounds amazing. What a fun breakfast casserole to make for a crowd! I love it. So easy!